Specific activity: approximately >25 units/mg. ADA, also known as adenosine deaminase, catalyzes the hydrolytic deamination of adenosine and 2-deoxyadenosine. This protein plays an important role in purine metabolism and in adenosine homeostasis. 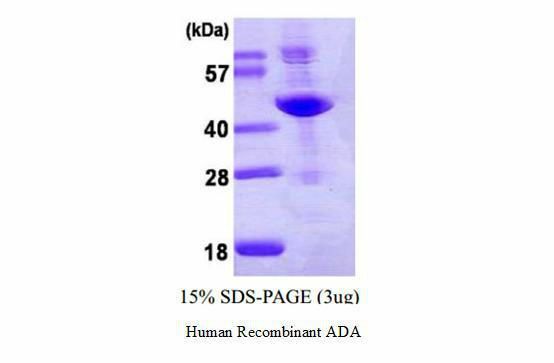 ADA acts as a positive regulator of T-cell coactivation, by binding DPP4. Its interaction with DPP4 regulates lymphocyte epithelial cell adhesion.